With so much elaborate cooking for the holidays it can be a relief to have simple recipes on your roster. And I personally like to avoid any breakfast recipes that require a food processor or a stand mixer. Who wants to deal with all that whizzing and whirring and clutter first thing in the morning? 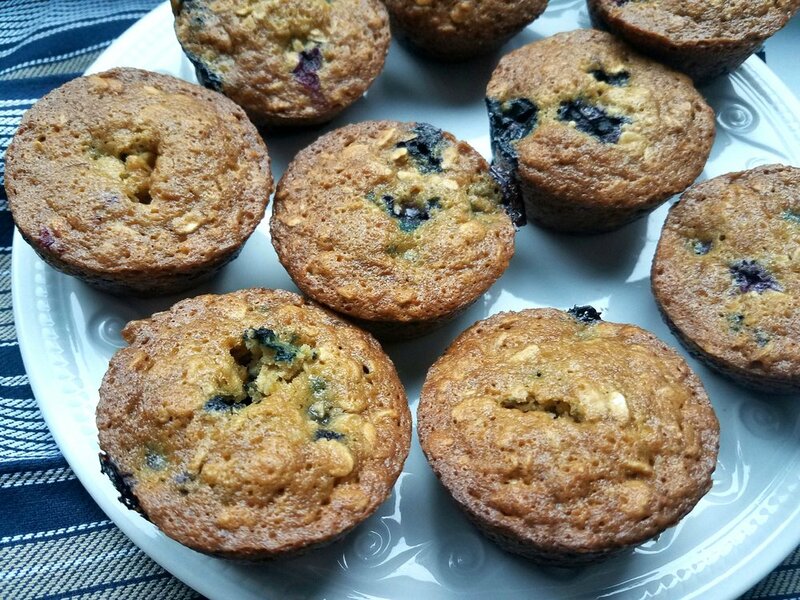 About as non-fussy as a baked good can get, these Blueberry Maple Oatmeal Muffins from the "Cooking with Blueberries" feature of the July 1995 issue of Gourmet make for a hearty, subtly sweet breakfast for Christmas Eve morning, Christmas Day morning, Day After Christmas morning, or basically any morning all winter long. Stir remaining flour mixture into cream mixture until just combined. In a bowl toss blueberries with reserved flour mixture and stir mixture into batter. Divide batter evenly among muffin tins and bake in middle of oven 20 to 25 minutes or until a tester comes out clean. Let muffins stand in tins 5 minutes and turn out onto a rack to cool completely. Makes 18 muffins.